Seiko has a wide variety of a product line making clocks and watches with nearly a century of design and producing watches. In this article, we will be reviewing the Seiko SKX009 men’s watch. Included in the review will be pros, cons and product features that may help you decide if this is the proper watch for you, a friend or family member. 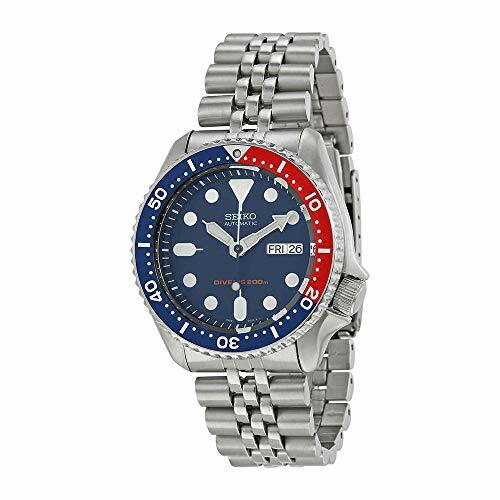 If you don’t want to spend too much on a quality watch, the Seiko SKX009 may be just what you are looking for as the price is right around $200.00 to $225.00. The Seiko SKX009 does offer a 2-year warranty for defects in workmanship and you are urged to contact Seiko for any repairs needed during this warranty period. Seiko was founded in Tokyo, Japan in 1881 and incorporated in 1917. It was founded by an entrepreneur named Kintaro Hattori where he opened as a jewelry and watch store that also began producing clocks in 1892. More recently, Seiko released the worlds first Solar GPS watch in 2012. In Japanese, the word “Seiko” means success or exquisite which makes perfect sense with the quality of their wristwatches. Seiko is known for their wristwatches for this reason. In 1869, the company released the world’s first quartz watch which was known as Astron. The Seiko SKX009 is a great choice if you are looking to spend around $200.00 for a wristwatch. The watch has some basic and advanced features including a scratch resistant hardlex crystal. The watch is extremely durable with a 22 millimeter 5-link stainless steel band and fold-over safety clasp that folds into the 45-millimeter stainless steel case. The watch is battery free which means less time spent fooling with batteries and more time enjoying its beauty and quality craftsmanship. Although the Seiko SKX009 is called a dive watch, it is not meant for scuba diving. The watch is waterproof up to 660 feet and is suitable for surface watersports usage. The Seiko SKX009 has a beautiful design with a unidirectional bezel, blue dial, luminous hands and indices with a day and date window. The watch is automatic which means that is it powered by the movement in your wrist. Who Use The Seiko skx009 Automatic? Seiko SKX009 is a great starter automatic watch if you don’t want to fool around with batteries. You should consider this watch if you are looking for a good quality waterproof watch but if your budget for a watch is under $200.00 you will have to pass as this watch generally costs right around the $200.00 mark. With its durability and reliability, the Seiko SKX009 makes an attractive watch for those looking for a durable and affordable watch. This watch is also a good option if you are looking for some fancy aesthetics on a men’s watch at an affordable price. Looking for a perfect automatic watch that won’t put a huge dent in the bank account? ; look no farther as this watch is what you have been looking for! Just remember that when you are just beginning to look at watches, it is best to pick an established brand so you know there is some quality workmanship behind the product and won’t fail on you. When you are considering the purchase of a quality watch, looking at the construction of the case should be a priority. This can tell you about the watch’s durability. The case is a near-perfect size by today’s standards for size. The stainless steel construction provides a few benefits including being stainless, durable, and more affordable than titanium. Overall, the quality and performance are there to provide you with many years of worry-free operation. The Hardlex crystal is a scratch-resistant watch head that prevents damage to the watch and extends the life of the watch. While hardlex crystal is not as strong as sapphire crystal, this is a good beginner watch with a quality face. The good thing about the hardlex crystal is that unlike the sapphire crystal, that can shatter, the hardlex will not shatter, even in professional use. Overall, the watch’s mechanisms will be protected from light impacts. With the 5-link 22-millimeter wide stainless steel armband, the Seiko SKX009 provides a strong strap that will prevent accidental breakage. Some may think the strap does not have the solid feel on your wrist unlike some other wristwatches on the market today. It also has a fold-over safety clasp to prevent the watch from falling off accidentally to prevent being lost or damaged. You can purchase a watch winder separately that will allow you to adjust your watch to the correct time. You should definitely consider purchasing a watch winder since it will make adjusting your watch easier. It is important to note that the Seiko SKX009 is a self-winding watch with the Seiko 7S26 movement. Quality wristwatches can range in price from hundreds of dollars to even thousands. The Seiko SKX009 offers a good quality watch for a pretty affordable price. This watch will set you back around $200.00 but you will save money in the long run by not having to purchase batteries as it is automatically run. When you add in some of the features like the stainless steel armband and luminescent hands, you will see that the watch is definitely worth the price which makes it worth the bang for the buck. Up to 660 feet, that is the amount of water you can be in until the Seiko SKX009 would stop working. 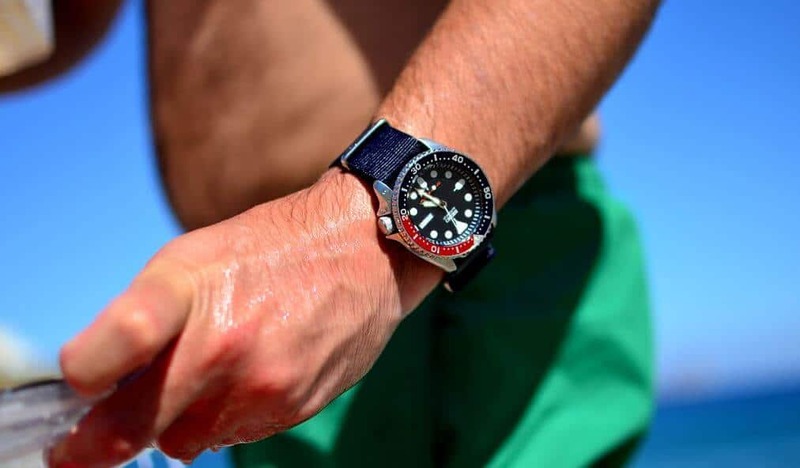 While this watch is not good for scuba diving, you can easily swim or so water sports such as water skiing with the watch on and not worry about the watch malfunctioning. Another great thing about the watch being waterproof is that while you are swimming you can keep an eye on the time instead of having to get out of the water every so often to check it at your seating location. Why waste time fiddling around with changing batteries in a watch when they go dead when you can have a quality automatic watch that doesn’t need batteries to keep time. A big benefit to this is that it will actually save you money over the course of the years you have the watch by not having to purchase replacement batteries which we all know are not cheap now of days. This also saves you time by not having to reset the watch every time a battery goes dead. There is a “green” benefit to this as the batteries won’t end up in the landfills either! Like with most watches, the Seiko SKX009 offers 5-minute marks to help you easily see the current time. You can just glance down at your watch and get the current time in an instant. While the 5-minute marks are common on most wristwatches, this is a benefit that you just can’t seem to go without in the world now of days. When it is dark, you always have to try to find the Indiglo button on most watches, but with the Seiko SKX009, you don’t have to worry about that as the hands and hourly time markers are luminescent. So no matter what time it is, you will always be able to see what time it is at a glance at this great watch from Seiko. The luminosity is one of the most beneficial and strongest of the Seiko brand diver watches. At the three o’clock time slot, the day and date are displayed. This will help you make sure you don’t forget those important appointments or pick-ups. You will never have to worry about remembering what day of the week it is and what the date is. You may, however, forget the month as the month is not displayed on the watch. The crown on the SKX009 is positioned at four o’clock like most Seiko diver watches. It is held down by two screws as it should be and the screws screw down and unscrew very smooth. The crown gives you a good secure feeling that you can do pretty much anything while wearing this watch. Q: This watch is called a Diver’s watch, but the description says it’s not ok to dive with it…Is it suitable for a dive watch at the specified depth? A: It’s perfectly ok to dive with it. It is rated to 200 Meters! But please, don’t go that deep! Q: Does this watch have English and Spanish or English and Arabic for the day? Q: Does the jubilee bracelet have solid end links? A: Yes, it does. Very well made. Q: How loud is this watch? A: It is silent and you can not hear the sound of the mechanisms or second hand. Q: Does this watch require a battery? A: No, the watch does not need a battery. While wearing the watch, the watch keeps the time since it is automatic and keeps the time by the movement of your wrist. If the watch is not worn for a long period of time (usually over 40 hours), you will have to reset the time. 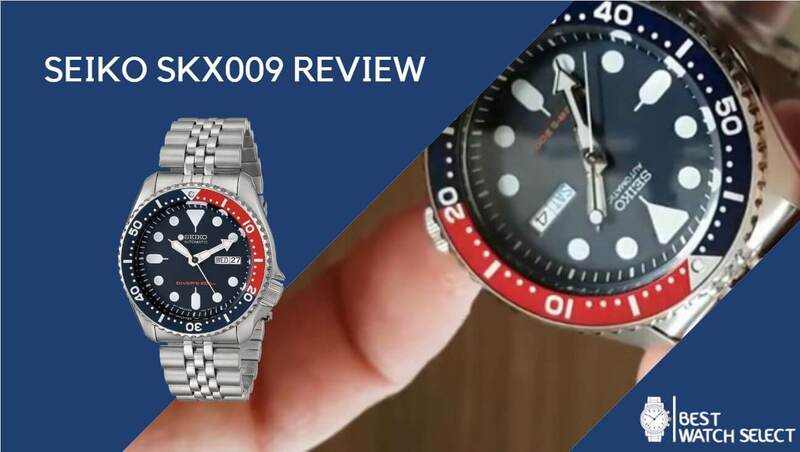 As we conclude the review of the Seiko SKX009, we have learned that the watch is a quality product but like most watches, there are some drawbacks. Depending on your daily life, these drawbacks may not affect you at all. If you are concerned about the price, the price is between $190.00 to $250.00 but the watch comes with some good benefits which make the watch worth the money spent to purchase it. Other watches with the same features and durability may cost double of what you can pay for the Seiko SKX009. The stainless steel constructions offer better durability than most nylon armband watches of this price range. Features such as the hardlex crystal watch face to prevent scratching and the waterproof to 660 feet deep are more strong reasons to consider this watch. Overall, there are many features you will get with this watch without paying a large amount of money. Sadly this watch is only available in the red/blue face though, some may say that the watch face is grey or a bluish-grey, but that should not turn you away as the loaded features will never let you down. Seiko has rewarded itself by delivering another high-end product at a low-end cost for the consumer. 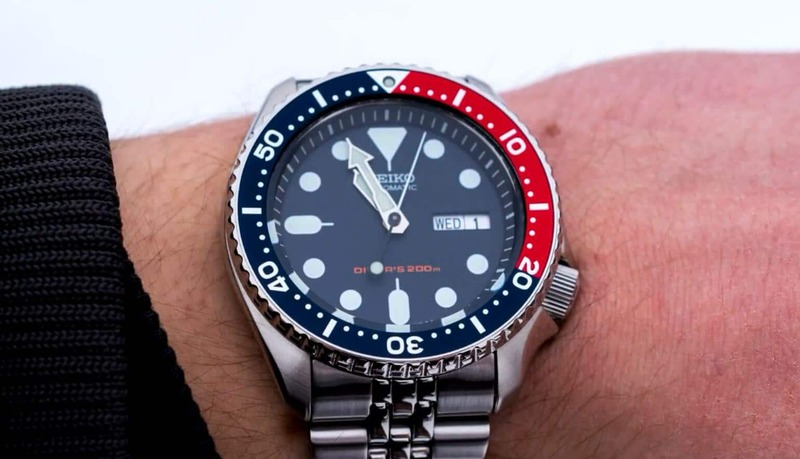 Based on numerous reviews that we have read, customers who have purchased the Seiko SKX009 have been happy about the quality and overall appearance of the watch. There have only been a few customers that have said the watch is either too fast or too slow on keeping time. This could be due to some customers being overactive which makes the watch tick slightly faster or others not wearing the watch enough and the time becomes slower. You can get a lot of watch for just a small amount of money which makes the Seiko SKX009 budget friendly.